Apr - 28 | By: theriot | no comments. 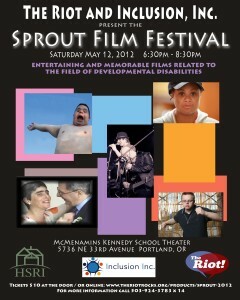 Join us for an evening of thought-provoking short films showcasing the lives, performances, and accomplishments of people with developmental disabilities at the Sprout Film Festival, Saturday, May 12th at the McMenamins Kennedy School Theater from 6:30 to 8:30 pm. Purchase paperless tickets online to reserve your seat: http://www.theriotrocks.org/products/sprout-2012. Or arrive early and purchase your tickets in the Theater. Seating is limited! We recommend purchasing tickets online before the show. Guests are invited to order from the full McMenamins food and beverage menus in the Kennedy School Theater and enjoy the show. We also invite you to purchase raffle tickets to win fabulous prizes including a Maryhill Winery tour and tasting for eight, tickets to the Oregon Ballet Theater or Portland Center Stage, a dozen cupcakes, yoga classes and more! Funds raised will benefit The Riot! and Inclusion, Inc. The Sprout Film Festival (http://www.gosprout.org/film/sff2012/general.html) was founded in 2003 by Sprout, a NYC-based non-profit organization, dedicated to bringing innovative programming to people with developmental disabilities. Sprout has been making videos related to the field of developmental disabilities since 1995 and has witnessed the myriad benefits these videos have for this population and the general public. The Festival premieres annually at the Metropolitan Museum of Art in NYC and tours the country. The Sprout Film Festival will be in Portland for the first time! The Riot! is a quarterly electronic disability rights and advocacy newsletter written by people with intellectual and other developmental disabilities with support from staff at the Human Services Research Institute in Tualatin (www.hsri.org). Each issue focuses on a topic like real jobs for real pay, closing institutions, relationships and sexuality to name a few. The Riot! also features an online gallery where artists can show and sell their work (www.theriotrocks.org). Inclusion, Inc. is a 501(c)3 non-profit organization who’s staff of personal agents support 700 Oregonians with a variety of disabilities living in the Portland area (www.inclusioninc.org). Supports include planning based on a person’s identified needs, locating and paying for services, and building service networks in the person’s home and neighborhood which are responsive to the desires and needs of each.